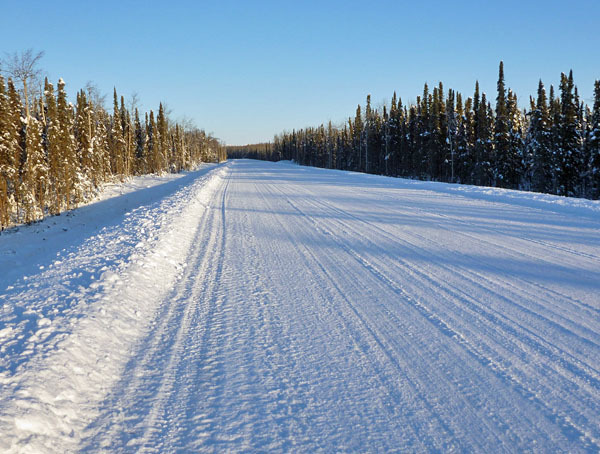 Jim Oksuktaruk and I recently skied the 46 km Campbell-Coastal-Chester loop. 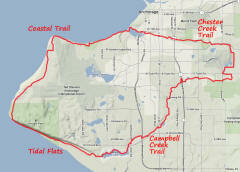 So, there is now a trail on the tidal flats from Campbell Lake to Pt. Campbell. 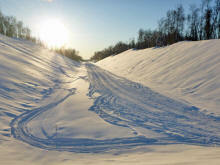 If are looking to go for a ski on the coast (classic skiing) or do this loop ... now is a good time. This trail will be gone with the next significant snow or wind event. Tip: We started and ended this loop at the small park just west of the Dimond Blvd bridge over Campbell Creek. But doing this, you get the soft-conditions classic skiing done first. Then you can skate the rest of the loop. Late December 2013: Flamingo Survives Wolf Attack! 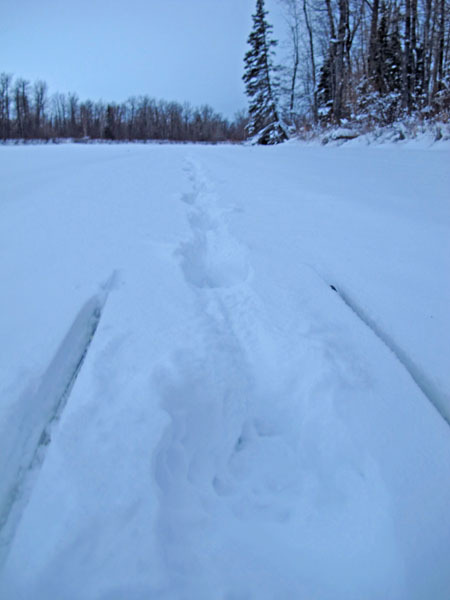 Recently I was skiing on Alexander Creek. South of Dinglishna Hill my route intersected with recent tracks from a pack of four wolves. As I followed the tracks I realized that they were making a beeline towards the Woodhead's pet flamingo! "Oh sh*t!" I said to myself, "No! Not the flamingo!" 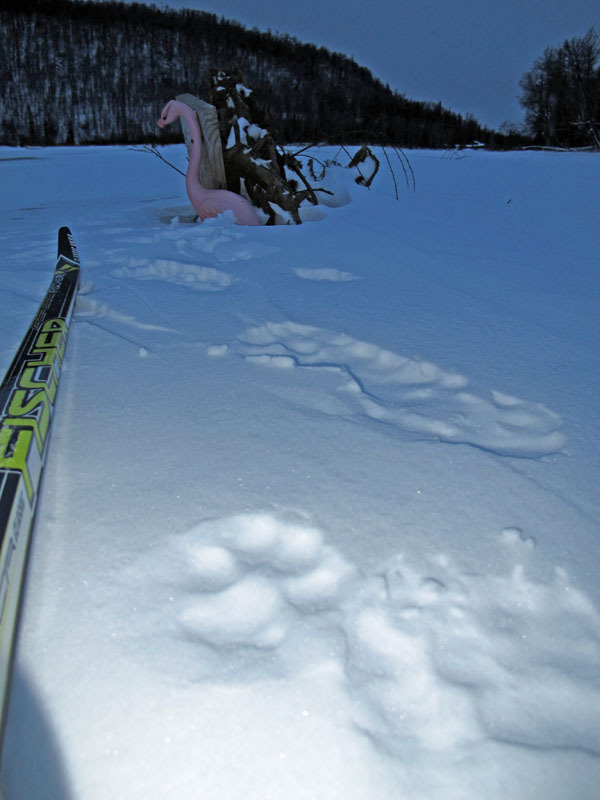 As I approached the flamingo I could see wolf tracks everywhere. 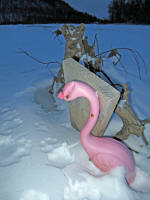 But I was relieved to see that the flamingo was still standing. It must have been quite the melee. But flamingos are tough birds. And this one apparently fought until the wolves gave up and left in search of easier prey. 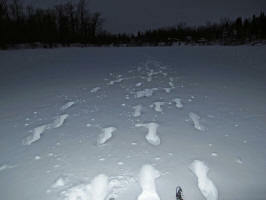 I then followed the wolf tracks down the creek. Near the mouth of the creek the single file trail split and the tracks showed that all four wolves had picked up the pace and were running. Sure enough, they had spotted a moose and calf. 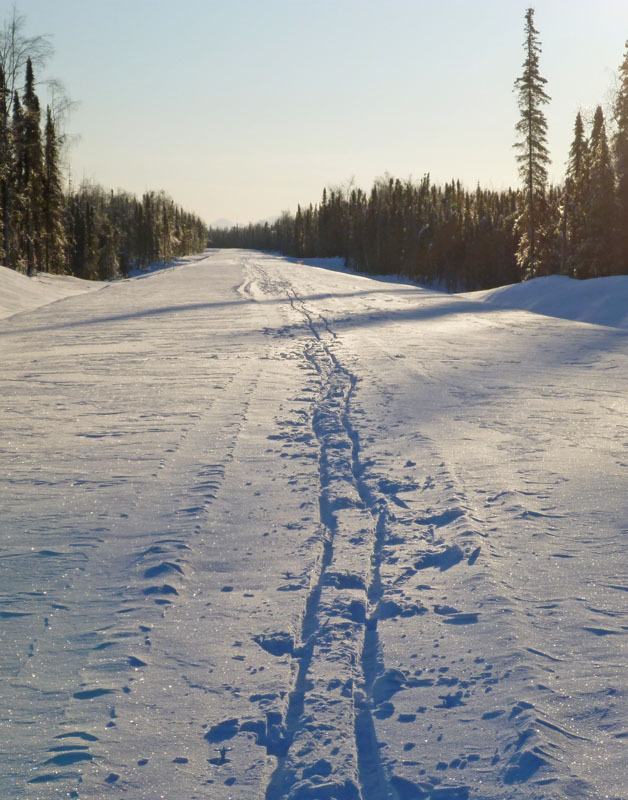 Their tracks veered and adjoined with tracks of two moose. You could see where they had culled the calf from the mom moose. The mom moose ran downstream but the calf was driven up the bank and into the woods. My guess is the calf didn't fare as well as the flamingo. Wolf tracks leading up to the flamingo. Wolf tracks around the tough flamingo that fought off the beasts. Wolf pack tracks heading down Alexander Creek. 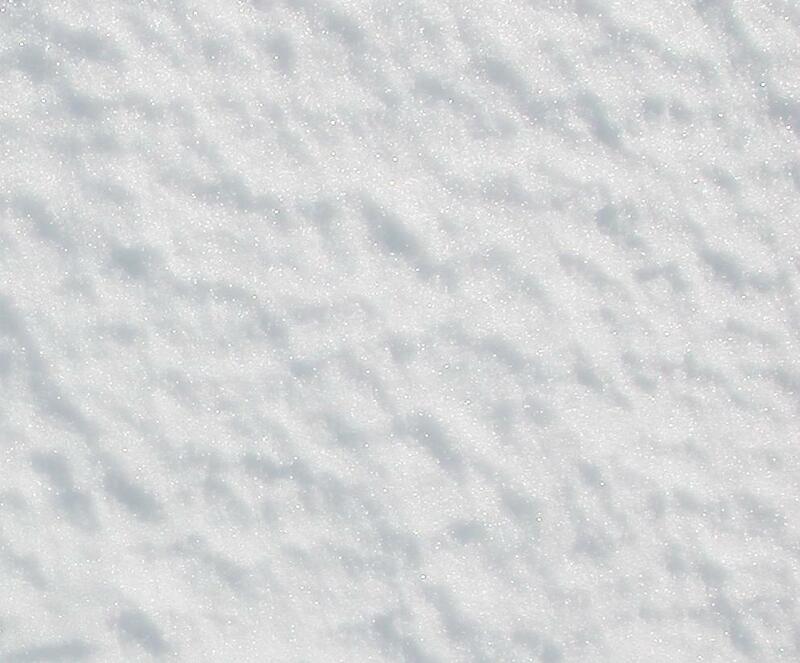 The four wolves break out of single file and speed up in pursuit of a moose calf. The wolves cull the calf from the mother and drive it up the bank and into the woods. Nature is brutal. I went up to the Valley to check out, and ski on, the new railroad that is under construction. 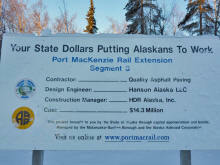 This project is called the Port MacKenzie Rail Extension. 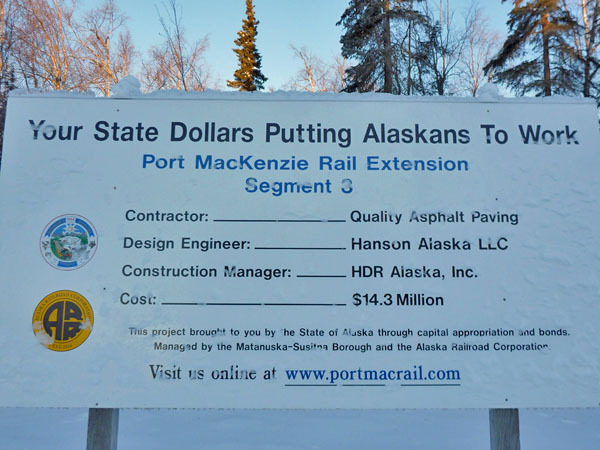 It will be a spur of the Alaska Railroad from Houston to Pt. MacKenzie. 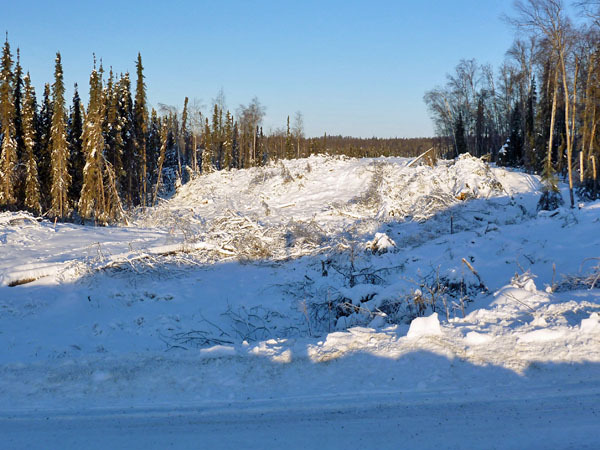 At present, sections from Ayrshire Road north to the Papoose Lakes Road and from Houston south to Miller's Reach have been cleared and a railroad bed has been constructed. 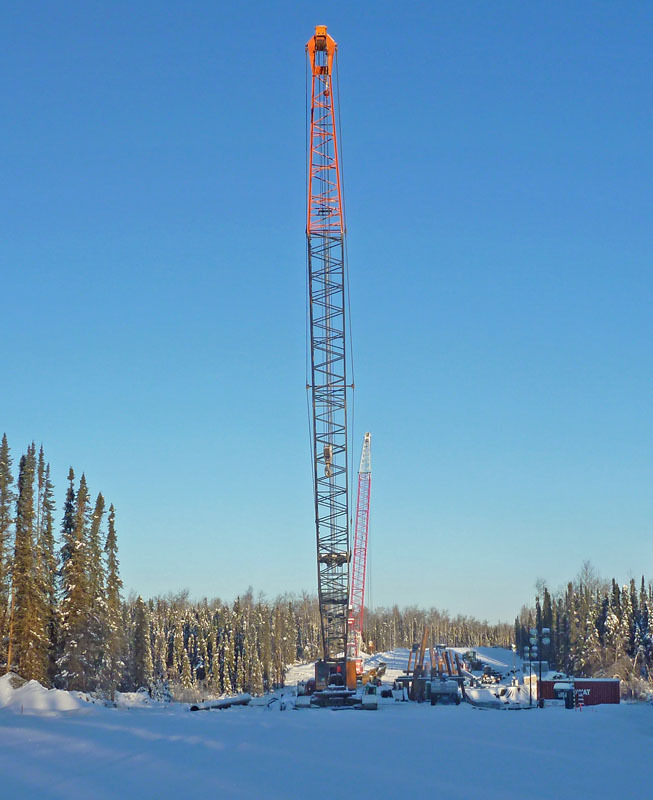 There still is some pile driving going on for making overpasses for the current and old Iditarod Trails. 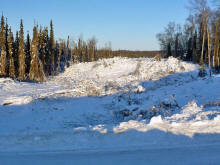 And there is logging being done on the Miller's Reach to Papoose section. I figure that later in the winter this route will be very popular for all forms of snow travel. This route will make a good "backbone" route for doing loops in the Lower Su Valley/ Big Lake area. 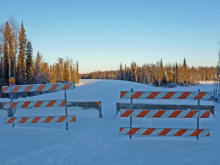 How long will this route be a winter trail before rails are put down? Who knows ... it depends on state funding. 2 years? 3 years? More? So go ski/bike/sno-go the Pt. Mac railroad route while you can. End of the rail extension construction at Ayrshire Road at Pt. Mac. 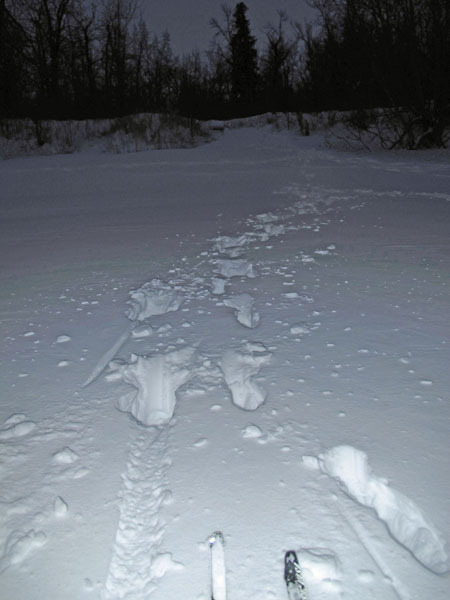 Sub-zero trail shuffling on the new (made last summer) railroad bed. Still some pile driving is still going on. I figure this will end before long. 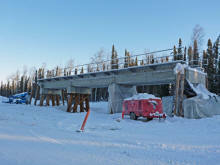 This will be the overpass over the Old Iditarod Trail. North of the Iditarod Trail crossing the rail bed was plowed. Fast skating here. It's wide because the tracks will be offset and a service road will be alongside the railroad. 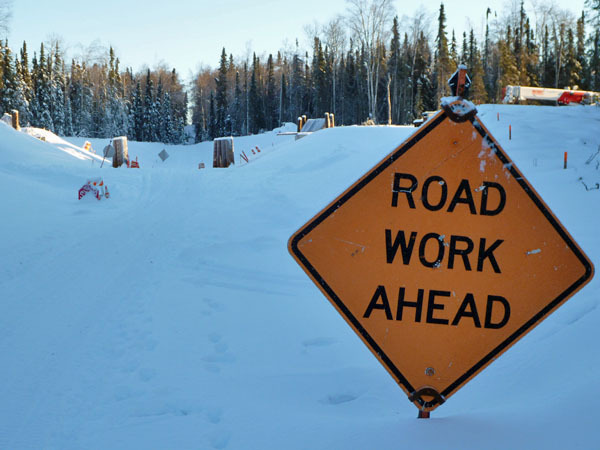 The railroad extension work ends at the Papoose Lakes Road. 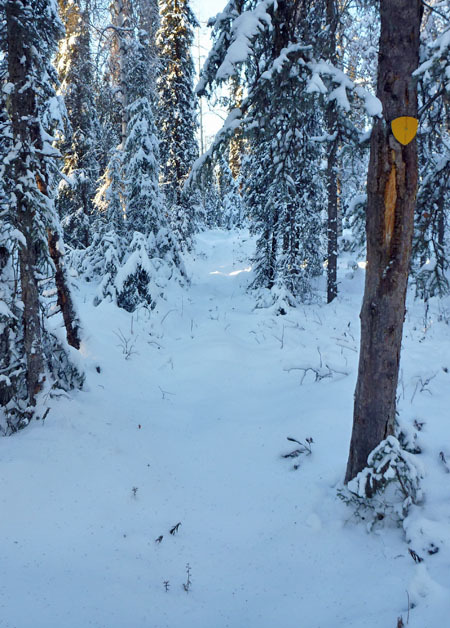 To the north of the Papoose Lakes Road, rough clearing of the right of way has been done. Another Mat-Su Borough project. Will this one actually make economic sense? Time will tell. 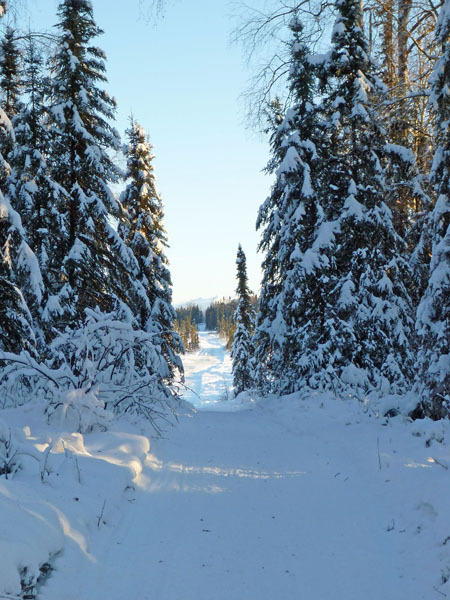 The Old Iditarod Trail is not used much anymore, and is becoming a faint trail. 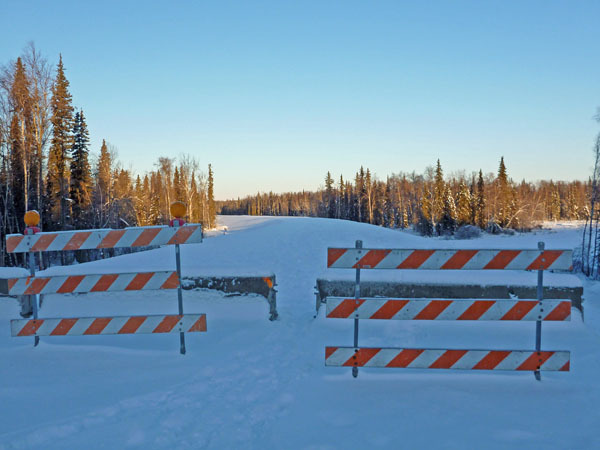 Another bridge will cross over the modern Iditarod Trail (Big Lake Trail #14). 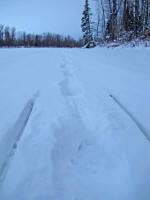 Good skate skiing on Trail 14, and Trail 11. When I travel, I like to check out grocery stores. 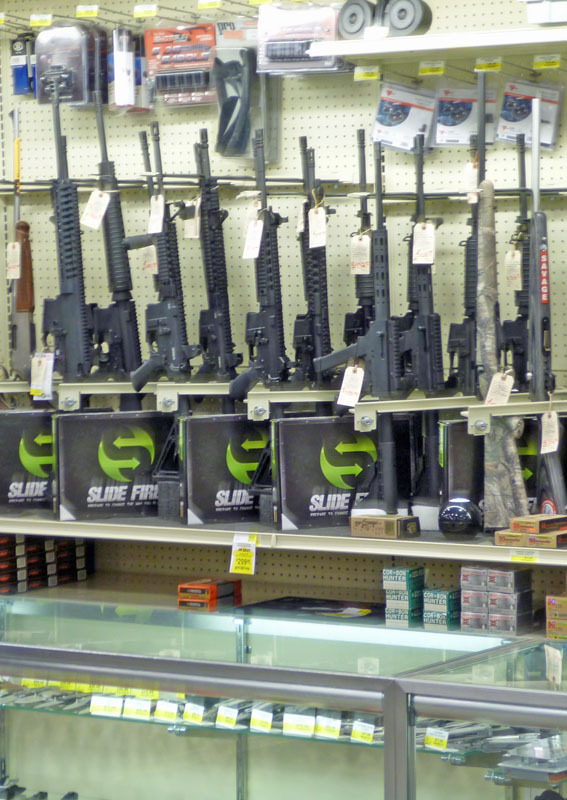 Grocery stores tell you a lot about the people that live in the area. On this trip I stopped at the Three Bears store on the Knik-Goose Bay (KGB) Road. Nice store. But inside I got a similar "I'm not in Anchorage anymore" feeling that I have felt in recent years in grocery stores in places like Chile and Iceland. This store has it's own signature brand of camo clothing and Winchester 300 mag rifles. 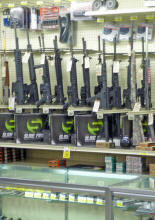 And the number of "black gun" assault rifles for sale in this grocery store certainly gets your attention.